The Select by Calphalon Stainless Steel 8-Piece Cookware Set offers a generous selection of pans designed for everyday cooking. Each one features impact-bonded aluminum bases for even heating. Built to last, these durable stainless steel pans also have comfort-grip handles that stay cool on the stove top. This kitchen cookware set is dishwasher safe for quick and easy cleanup. Each piece is also oven safe up to 400 degrees Fahrenheit. The stainless steel cookware set includes an 8&quot; fry pan, a 10&quot; fry pan, a 1.5-qt saucepan, a 2.5-qt saucepan with cover and a 5-qt dutch oven with cover. You can cook on gas, electric, glass, induction and halogen stoves with these kitchen accessories, using metal, nylon, coated and wooden utensils. The lids are made of tempered glass so you can keep an eye on your food. This set makes an excellent addition to your own kitchen or a wonderful housewarming or wedding gift for others. The Select by Calphalon Stainless Steel 8-Piece Cookware Set offers a generous selection of pans designed for everyday cooking. Each one features impact-bonded aluminum bases for even heating. Built to last, these durable stainless steel pans also have comfort-grip handles that stay cool on the stove top. This kitchen cookware set is dishwasher safe for quick and easy cleanup. Each piece is also oven safe up to 400 degrees Fahrenheit. The stainless steel cookware set includes an 8" fry pan, a 10" fry pan, a 1.5-qt saucepan, a 2.5-qt saucepan with cover and a 5-qt dutch oven with cover. You can cook on gas, electric, glass, induction and halogen stoves with these kitchen accessories, using metal, nylon, coated and wooden utensils. The lids are made of tempered glass so you can keep an eye on your food. This set makes an excellent addition to your own kitchen or a wonderful housewarming or wedding gift for others. We had been needing a new pan set for a few years and my only requirement was that I wanted stainless steel. This set exceeded my expectations. The stay cool handles are just wonderful! I don't think I can ever go back now! They are SUPER easy to clean. I have burned all sorts of things on them and it wipes off no problem. I also love that I can just throw them in the dishwasher. The glass lids are an extra bonus so you can see if the food is done cooking. Although I received this product for free all opinions are my own. I am very impressed with the quality of this set. They are very high quality and heavy duty. One of my absolute favorite parts of these pots and pans are the handles. One thing i can't stand about some pans is how the handles heat up. These are amazing. I haven't grabbed a hot handle and it also helps with gripping pots when they are full. Another part that i love is all the lids. I've always covered my frying pan with tin foil it's so nice to have a lid now. I can actually see my food cooking without having to pick up the tin foil. I really can't think of any downsides to this set! I received this set of pots and pans free to review. However all opinions and thoughts are my own. While I received this product for free, the opinions and thoughts included in this review are my own. Good cookware does change the way you cook. This Stanless steel set is a great starter set for the price. It has most of the features of more expensive sets like Stainless steel construction ensures even heating, Dishwasher Safe (who has time for hand washing), Comfort grip, stay-cool handles Full 10 year warranty, Oven safe up to 400ºF for one pot cooking, and pretty Tempered glass lids so you can see how things are going without lifting the lids. The sizes included in this set are also perfect for someone just starting a kitchen or for someone looking for a great set but does not want to pay hundreds of dollars. I would add a nonstick pan to this set other than that it is a well rounded set. 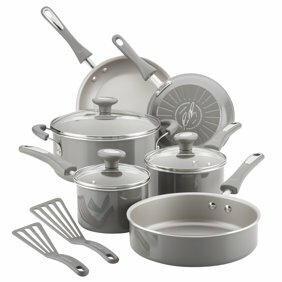 When I received this Select Stainless Steel 8-Piece Set, I was excited to begin using it. We are slowly transitioning all of our pots and pans to stainless steel and we are new to the world of cooking with stainless. I was worried about burning my food and I was concerned that there was a learning curve to using these pots. Neither of these things happened. With these stainless steel pots and pans, I found that everything I cooked cooked evenly. Whether I made an omelet, reheated soup, boiled pasta, etc, the food cooked quickly and evenly and I did not have to deal with burnt food or the messy residue leftover from burnt food sticking to the bottom of pans. I also loved the fact that these pots and pans are oven safe in temperatures up to 400 degrees. I have never owned oven safe pots and pans before. So to be able to cook a dish on my stovetop and then place it in my oven to complete cooking was awesome. The one tip I have is to make sure you use a high temp cooking oil. I found that when I used olive oil (not a high temp cooking oil), food would sometimes stick. These pots have a 10 year warranty and I love that peace of mind! While I received this product for free, the opinions and thoughts included in this review are my own. These pots are heavy. They cook the food evenly. They are a good investment for the price. I do like my new Stainless cookware, it heats very quickly and retains even heat. What I don't like about it is it seems to have a film in the bottom that I cant remove. I've tried steel wool and it didn't help. While I received this product for free, the opinions and thoughts included in this review are my own. I have used nonstick cookware for over 10 years and have recently decided to make the switch to stainless steel cookware. I have a 10" Calphalon skillet that I LOVE so I knew that getting a full 8 piece set would be a great decision. And I was right! As with my other stainless steel Calphalon pan, I love this cookware set's compatibility with seemingly any cook top (glass, propane, electric and induction), utensil material, and its dishwasher safe. I've used this cookware set for a few weeks for all of my family cooking and have been very satisfied with its performance. The pans cook evenly, the lids fit snugly and the handles feel solid. I like the silicone casing over the handles on the pots and pans as well as the lids; this helps with heat absorption and I am less likely to burn my hand. I really see this set lasting me decades without any issue. Because I am able to compare this "Select" line to the "Signature" line, the biggest difference that I could notice is the gauge of the metal; the "Select" line feels slightly thinner and lighter. Regardless, I still am confident of it's performance and lifelong value.